Legendary storyteller and author Kathryn Tucker Windham is much in the news this October as the town of Thomasville, Alabama prepares for the 7th Annual Kathryn Tucker Windham Ghost Walk on October 23 and Birmingham’s Red Mountain Theatre Company debuts 13 Alabama Ghosts and Jeffrey: A Haunting New Musical on October 29. 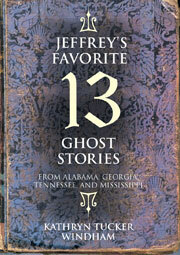 Mrs. Windham’s Jeffrey’s Favorite 13 Ghost Stories, an anthology of Mrs. Windham’s very favorite tales published by NewSouth Books, will be making lots of Halloween appearances in connection with these activities. The Birmingham News caught up with Mrs. Windham for a front-page story that ran on Sunday, October 17. Alec Harvey’s wide-ranging piece included an interview with Mrs. Windham, and appreciation of her work from fellow authors and storytellers. Harvey pointed out that Mrs. Windham’s current busy schedule concludes a year in which she battled breast cancer and had a pacemaker replaced. So Kathryn Tucker Windham — journalist, photographer and single mom — became a storyteller. “I started at the top,” she says with a laugh. Mrs. Windham continues to tell stories through her books, the most recent a memoir called Spit, Scarey Ann, and Sweat Bees: One Thing Leads to Another, published by NewSouth Books. But the scariest thing about the book isn’t very scary at all — it’s the way the black hair on the old-fashioned doll known as Scarey Ann would stand up straight with the pushing of a button on the doll’s back. Things were simpler then. And for Kathryn Tucker Windham maybe also less busy. Spit, Scarey Ann and Sweat Bees: One Thing Leads to Another, Jeffrey’s Favorite 13 Ghost Stories, Alabama, One Big Front Porch, and Ernest’s Gift are available from NewSouth Books or your favorite retail or online book seller. The sound of the Buckeye Band filtered through the air this past weekend in Moreland, Georgia, as friends and fans gathered to remember Lewis Grizzard at the first Lewis Grizzard’s Hometown Reunion festival. As covered by the Newnan Times-Herald, the weekend ended with a “Toast to Lewis Grizzard,” featuring remembrances of Grizzard by colleagues and relatives, including Grizzard’s widow Dedra. 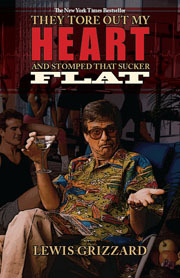 During the weekend, Dedra also signed copies of Grizzard’s They Tore Out My Heart and Stomped That Sucker Flat, newly re-released by NewSouth Books. In an earlier interview with the Times-Herald, Dedra described her plans to republish other of her husband’s books with NewSouth, including Elvis Is Dead and I Don’t Feel So Well Myself, If I Ever Get Back to Georgia I’m Going to Nail My Feet to the Ground, and My Daddy Was a Pistol and I’m a Son of a Gun. Dedra called the latter book her favorite of the four. The Hometown Reunion weekend also included an exhibit of Grizzard memorabilia, a parade, barbeque and grits-cooking contests, and a showing of Bill Oberst’s one-man Lewis Grizzard show. Carol Chancey of Cloudland Canyon Entertainment, organizer of the Lewis Grizzard’s Hometown Reunion, says she hopes to make the festival an annual event in Moreland. In a nicely observed piece about the life and work of Guy Carawan, Peter Dreier of The Huffington Post shares that Carawan will be honored at a “Singing for Justice” celebration on October 23 at the home of Jan Goodman and Jerry Manpearl in Santa Monica, California; tickets may be purchased for $35. Carawan is the legendary singer, folklorist, and activist whose arrangement of “We Shall Overcome” became the anthem of the Civil Rights Movement. Working from the Highlander Research and Education Center in Tennessee, a training center for grassroots activists where he was music director for many years, Carawan became an evangelist for the music that was his life. Documenting that unique connection between music and the Movement, Guy and Candie collected these songs and had them published in book form. Originally two volumes, We Shall Overcome and Freedom Is a Constant Struggle were reissued as Sing For Freedom: The Story of the Civil Rights Movement Through Its Songs by NewSouth Books in 2007, on the 75th anniversary of the Highlander Center. The book is a collection of freedom songs and many important photographic images, which along with copious notes makes possible an enhanced understanding of the Movement through its music. There is much history in this book, along with the songs. The stories and photographs remind us of a time when great changes took place in this country. We know from our work at Highlander and from our understanding of history that change happens when people organize and insist on the changes. In the early 1960s, the black South organized. Dr. Bernice Johnson Reagon has reflected on the role that singing played in maintaining a nonviolent movement: The singing of words of hope and defiance helped people maintain control and dignity in the face of great harrassment and danger. Surely we still need these lessons. 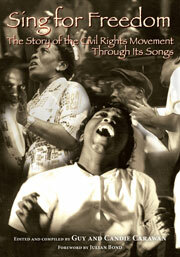 Sing For Freedom is available from NewSouth Books, Amazon.com, or your favorite retail or online bookseller. In back-to-back interviews for Karen Brown and Gene Edwards at Mississippi Public Broadcasting, syndicated newspaper columnist Rheta Grimsley Johnson reflects on her life, her work, and her books, including her newest, a memoir called Enchanted Evening Barbie and the Second Coming. In her interview for Brown on Mississippi Edition, Rheta relates with characteristic candor and humor the story underlying the book’s title: growing up Southern Baptist. She says, “We were all taught about the Second Coming,” noting “it was imminent and could happen tonight or tomorrow, but probably not as late as next week.” But as a young girl she asked God “to delay the end game” until after Christmas, when she was to get a new dress for her Barbie doll. Barbie, says Rheta, becomes a metaphor in her book for how a generation of women approached life, which brought happy times and sad times but also disappointments, and gives her a jumping off point for examination of her personal faith and work. Appearing with Louis Bourgeois and W. Ralph Eubanks on MPB’s Writers program, Rheta discussed her career as a newspaper columnist. She told host Gene Edwards that she’d always wanted to be a reporter, beginning when she was in the eighth grade. She was encouraged by English teachers and worked on her school newspaper; the experience convinced her she wanted to be a journalist. Two of the major influences on her writing style were Raymond Chandler and James Caine. Speaking about her memoir, Rheta added, “I’ve always had to write to make sense of my life.” Writing about her husband’s death for her newspaper column made her “start caring a sentence at a time about things.” Reader response to the three columns she devoted to her husband was positive and encouraged her to “think it was okay to make it part of a memoir” she was already working on. That volume, Enchanted Evening Barbie and the Second Coming, started out as a funny Christmas book and, well, “it became a different book,” Rheta noted. Enchanted Evening Barbie and the Second Coming is available from NewSouth Books, Amazon.com, or you favorite retail or online bookseller. Dr. Maya Angelou expressed her support for the new movie Son of the South — based on Bob Zellner’s memoir The Wrong Side of Murder Creek: A White Southerner in the Freedom Movement — with a fundraising party at her home October 3. In attendance were Zellner, Son of the South director Barry Alexander Brown, and a host of civil rights figures including former US Department of Agriculture staffer Shirley Sherrod. Son of the South, with executive producer Spike Lee, will bring to the big screen the events Zellner describes in The Wrong Side of Murder Creek. In the book, Zellner chronicles a lifetime of civil rights activism, from his childhood as the son and grandson of Klansmen to field secretary of the Student Nonviolent Coordinating Committee (SNCC), including his imprisonment for desegregation work and his meetings with Martin Luther King, Jr., Rosa Parks, and others. The Bulldog Nation enjoyed a touch of humor amidst their tough opening season when Dedra Grizzard, wife of the late Southern humorist Lewis Grizzard, spoke with the DawgDial radio call-in show. In the interview with Radi Nabulsi and Anthony Dasher, Dedra recalled her husband’s appreciation for UGA football, and discussed the numerous upcoming events celebrating Grizzard’s life, including the re-release of his book They Tore Out My Heart and Stomped That Sucker Flat by NewSouth Books. “Lewis was a devout worshipper of the Church of the Sacred Bulldog,” Dedra quipped. She is herself both a Georgia and Tennessee fan, and she recalled one occasion where Grizzard offered her money and even a red sports car if she would not wear Tennessee colors to a Georgia game; Dedra declined. She also talked about the time Grizzard hadn’t been scheduled a flight to a Georgia/Auburn game, and so he found a seat on a small plane, despite that it was carrying a corpse, in order to fly to Auburn. Dedra invited all Grizzard fans to attend the Lewis Grizzard’s Hometown Reunion festival on October 16 and 17 in Moreland and Newnan, Georgia. Among the events will be barbeque and grits-cooking contests, music by the Buck Eye Band, and a showing of actor Bill Oberst, Jr.’s one-man Lewis Grizzard tribute show, Lewis Grizzard: In His Own Words. The DawgDial radio program is available in podcast for listening online. Learn more about Lewis Grizzard’s Hometown Reunion at www.lewisgrizzard.com. They Tore Out My Heart and Stomped That Sucker Flat is available from NewSouth Books, Amazon, or your favorite local or online book retailer. You are currently browsing the NewSouth Books weblog archives for October, 2010.